Wherever you are in Philly, if you are relying on public transit this is the hike for you! At the most southern access point of the park is a public transit goldmine. The Wissahickon Transportation Center gets visits from buses 9,27,61,65,1,35,38,124,125, and the R. If the train is more your speed take the Regional Rail Norristown/Manayunk Line to the Wissahickon stop, which will leave you a short 10-minute walk from the Ridge Avenue Trailhead. 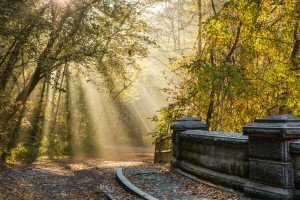 Along this shady hike you will encounter many icons of Wissahickon Valley Park such as 100 Steps, Hermits Cave, Hermitage, Lovers Leap and Blue Stone Bridge. The paved Bike Path, Yellow Trail and Forbidden Drive are open to all users, but some of the trails around the Hermit’s Cave are hiker only. The hike starts off on the smooth, paved Bike Path that that is fairly easy to navigate with limited inclines. 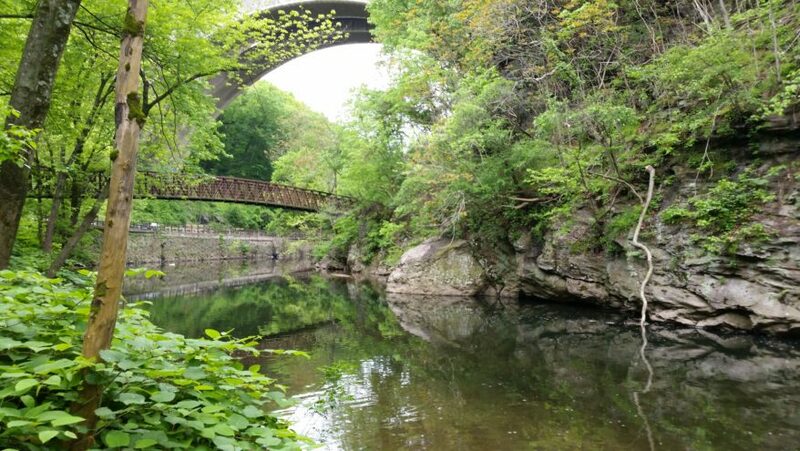 You will see the beautiful Wissahickon Creek on your right and some gorgeous rock formations on your left. 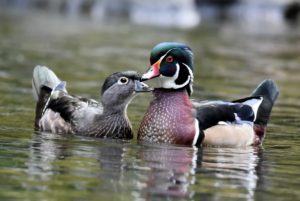 A raft of Wood ducks can usually be observed swimming and searching for food. About .2 miles in you will pass 100 Steps, take a walk up for some extra cardio! Keep a close eye out for Help Locator marker 100 – following this connector trail you will trade the more open and gentle characteristics of the Bike Path for a narrower, natural surface trail that is dense with flora. As you move onward through this moderately inclined portion of the trail you will notice an array of plant life, like native holly and ferns. If you are lucky you could also observe the May Apple. By now the fruit will surely have become lunch for one of our many furry friends. Just .1 miles up you will hit a fork, follow it right to explore the mystical Hermit’s Cave where Johannes Kelpius, the German-born mystic and religious leader is said to have meditated. A few minutes’ walk further and you will reach the Yellow Trail, follow it left to pass by the Hermitage Mansion. The Mansion can be traced back 300 years to a small group of Rosicrucians led by Kelpius, a religious sect composed of “hermits” or Pietists who emigrated from Germany in 1694 seeking freedom and privacy. Continue meandering the quiet Yellow Trail you will be able to appreciate the rise in elevation as you look down into woodlands. Here the tall White Pine trees cannot be over looked. In a little under a half mile, after passing underneath Henry Avenue Bridge, you will reach the treasured vista of Lover’s Leap. It is a perfect spot to take in the beauty of the Wissahickon. 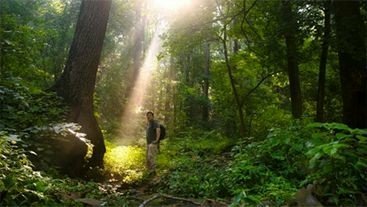 About .3 miles ahead you will reach Forbidden Drive, which was just named Pennsylvania’s 2018 Trail of the Year. Make a right and cross the Wissahickon Creek at the Blue Stone Bridge along Forbidden Drive. Stop to peek at rushing water and people fishing before continuing southeast. As you take Forbidden Drive and begin the loop back to the Ridge Avenue Trailhead take note of the different types of paths you have been on thus far, each has its own personality and highlights the diversity in our 1,800 acres.